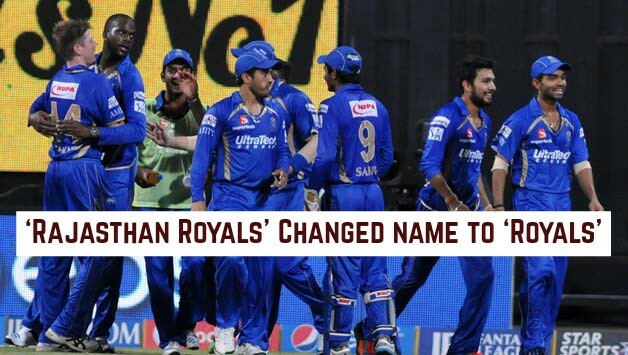 Rajasthan Royals proposal to change the name to “Royals” has approved by the IPL Governing Council; now onwards ‘Rajasthan Royals’ will be called as ‘Royals’. And also Royals is shifting is the base to Pune from Jaipur. The dropping of word Rajasthan from the team’s name had already been approved by GC. The team’s name now is just Royals. a IPL GC member said. Dropping off the ‘Rajasthan’ from was due to shifting its base to Pune. And shifting the base was a part of the deal with Sanjiv Goenka, who is the owner of the Rising Pune Supergiant. Rising Pune Supergiant along with Gujarat Lions was part of the IPL when Rajasthan Royal and Chennai Super Kings were suspended for two years. According to the reports, owner of Royals and Sanjiv Goenka had a Rs 1000-crore deal. But the IPL GC official denied any knowledge about the sales of Royals to Sanjiv Goenka. There is nothing as such on record in front of GC or BCCI. It is after the suspension of two seasons (2016-2017) Rajasthan Royal and Chennai Super Kings are making their return to the Indian Premier League in 11th season. Both the team were suspended because of involvement of both team owners in suspicious betting activity. Raj Kundra who was the owner of the Rajasthan Royals and Gurunath Meiyappan who is the son-in-law of the owner former owner of Chennai Super Kings (CSK) and also the Team Principal at CSK. Both had the life suspensions from the IPL and not allowed to associate with the IPL decision taken by the Supreme Court-appointed Lodha Committee. N Srinivasan has transferred CSK ownership among India Cemnets shareholders.